With the aim of carrying astronauts well beyond near Earth orbit to rendezvous with asteroids, the Moon, or Mars, the Orion Multi-Purpose Crew Vehicle (MPCV) spacecraft has no room for extra weight. That is why the engineers and designers of NASA’s next-generation spacecraft are finding ways to optimize every single pound that is added to the vehicle and looking at every system for opportunities to shave unnecessary mass. “Mass affects your ability to execute the mission, how far you can go, how long you can stay, and how many people you can take,” says Ms. Julie Kramer White, Orion MPCV Chief Engineer. Conceptual titanium orthogrid heat shield carrier mounted to pressure vessel. In late August 2012, Kramer White requested the NESC develop some alternate designs to the structure, with the goal of reducing its overall mass by 25 percent or about 800 pounds. “Because of how much weight was at stake, I thought the NESC was the ideal candidate for an independent look at how to get that mass out,” says Kramer White. “They have design, development, and build experience, and we needed to know that a design on paper would make it through to build and not gain a lot of weight. They were ideally situated to help us. At that time, the baseline design, made of titanium with a composite carbon graphite skin, weighed in at over 3,000 pounds. “It was a very agile design and could be easily manipulated and changed, but the Orion MPCV Program needed to know if it was the most mass-optimum design,” says Mr. Michael Kirsch, who led an NESC assessment team to work on alternative designs. The assessment team included members from industry, contractor partners, and NASA Centers including JSC, GSFC, LaRC, and MSFC. 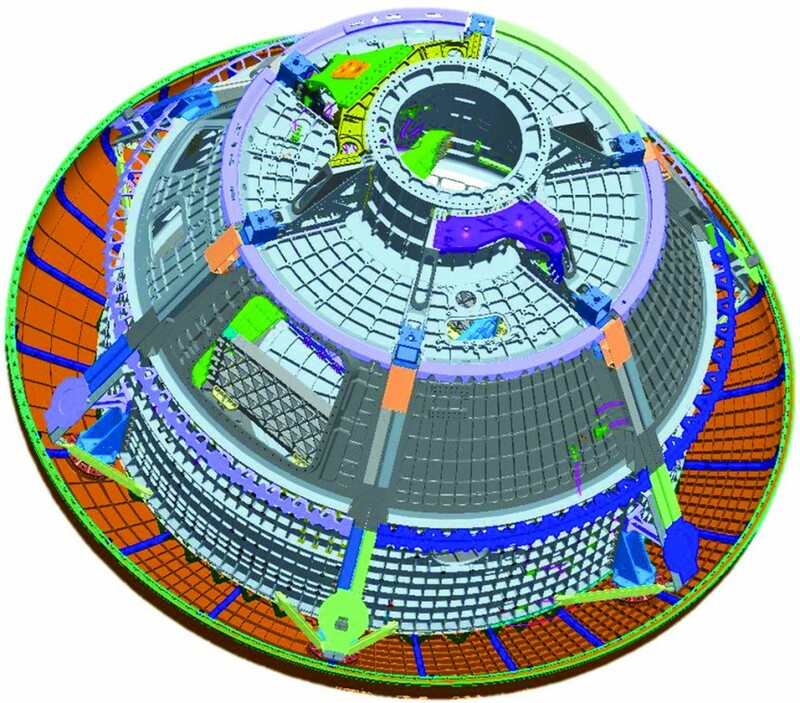 After studying Orion’s composite design, the NESC assessment team began developing several alternative concepts including designs that incorporated load sharing with the crew module backbone, replaced the existing wagon wheel stringer design with an H beam configuration, and switched the composite carbon graphite skin to a titanium orthogrid skin. 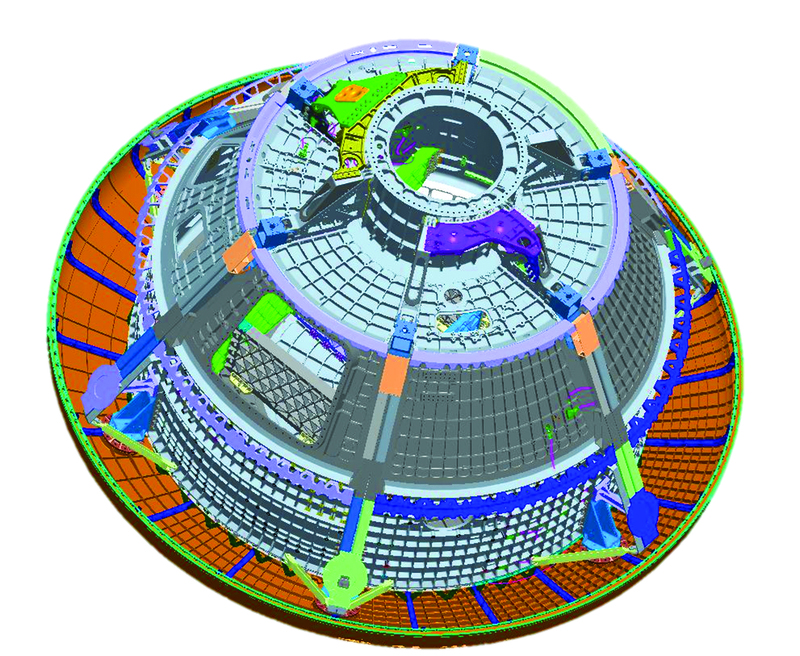 After discussions with the Orion MPCV Program, the NESC team carried two designs forward for further refinement, and in early February 2013, down-selected to the titanium orthogrid option. “This design was already saving a little over 1,100 pounds,” says Kirsch, about 300 pounds beyond the original 800 pound goal. The NESC team began talking with vendors to determine the best manufacturing approach for the titanium orthogrid. Encouraged by weight savings realized by the NESC team’s alternate design, the Orion baseline design was undergoing revisions as well and had significantly reduced its mass. So, in March 2013, the Orion MPCV Program asked for an apples-to-apples comparison between the revised baseline design and the NESC titanium orthogrid design. “For 10 weeks, the two designs were compared side by side, assumptions aligned, and adjustments made so that the two could be compared with a similar set of rules,” says Kirsch. 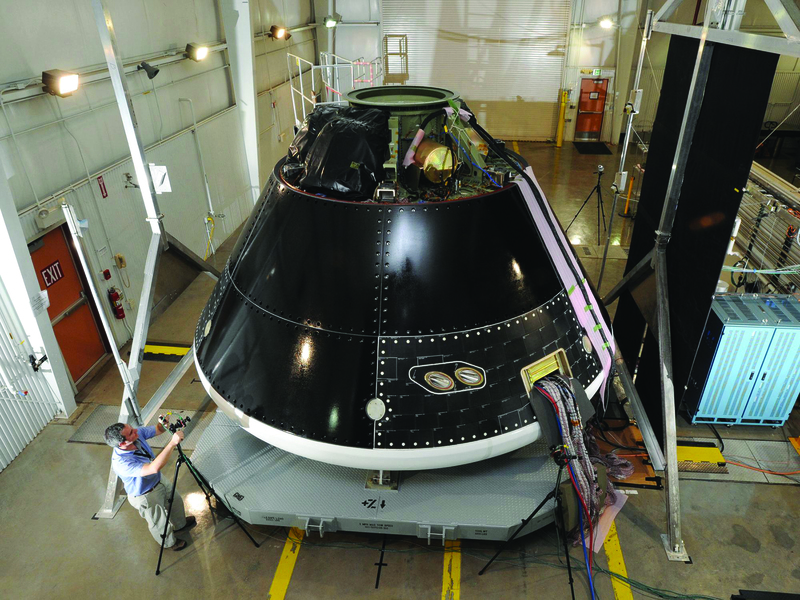 Orion crew module for Exploration Flight Test-1. By the end of May, the NESC design had reached a 1,300 pound weight reduction and the baseline design had undergone a significant weight loss as well — about 1,100 pounds. Weight savings, however, were not the only factors being considered. To be ready in time for Orion’s first operational mission expected in 2017, the NESC design required additional financial commitments for material procurement and manufacturing and had a tight schedule for construction. The baseline design, which was already built and tested, offered fewer manufacturing risks, little financial commitment, plus a shorter timeline to delivery. “That became a significant discriminator in the decision of which heat shield to select for the program,” says Kirsch. “The NESC’s alternative design promoted the aggressive redesign on the current baseline and the net result was a pretty significant reduction of overall heat shield mass,” agrees Kirsch. The baseline design will also feature NESC risk reduction solutions and test approaches developed during the assessment.